21 Natural and Man-Made Materials Vocabulary Word Cards with Pictures. 21 vocabulary words to use when learning about natural and man-made materials. Ideal to use as a word wall, as part of a classroom display or for subject related word games. Words include: chalk, coal, cotton, gold, iron, leather, oil, sand, silk, wood, wool, aluminum, brick, ceramic, concrete, glass, nylon, paper, plastic, synthetic rubber and steel. Four blank cards have been included to record additional words. Download the resource then print it out. Cut and laminate the title poster and each of the vocabulary word cards. 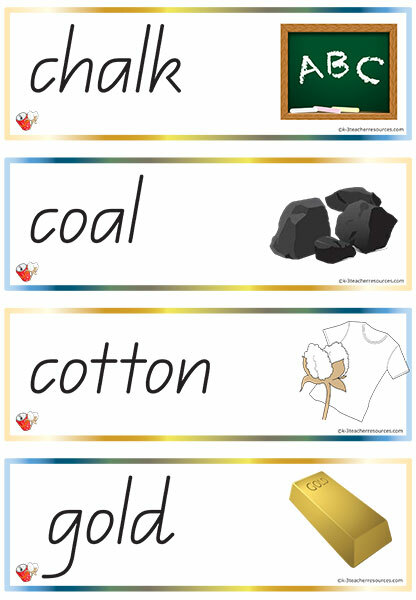 Use the poster and the word cards to create a classroom display. Alternatively, use the cards in a game where students have to identify if the material is natural or man-made. What’s next? – Choose a material from the word cards to research as a class. Identify if the material is natural or man-made, then investigate the process of how the resource is used to make different products.